TOKYO (Bloomberg) -- Troubled airbag supplier Takata Corp. began changing the safety devices in 2008 to reduce the risk that humidity would cause them to deploy abnormally, three people familiar with the matter told Bloomberg. The company changed the composition of its propellant mix to mitigate the effect of humidity after Honda Motor Co. announced the first recall related to the flaw in 2008, the people said, asking not to be named because they aren’t authorized to talk with the media. High humidity has been linked to a degradation of the propellant, increasing the risk that airbags may rupture and shoot fragments at vehicle occupants. Takata’s redesign to address the humidity problems, which hasn’t been reported before, may solve one of the mysteries of the auto-safety crisis. The company, which agreed Tuesday to expand U.S. recalls to include about 34 million cars, has repeatedly said its current products are safe, yet it hasn’t explained publicly the basis for its confidence. The majority of the vehicles recalled globally have airbags that were made before 2008. Tuesday's agreement, which involves 11 automakers, could become the largest industrywide recall action in U.S. automotive history. The redesign may also raise difficult questions for Takata since the introduction of a safer propellant mix could imply the previous mix was less safe. Takata didn’t recall additional cars with the older airbags until about seven months later. Automakers have subsequently expanded recalls of the devices, which have been linked to six deaths and more than a hundred injuries. Only selected parties including government officials have been informed by the company about the change to the propellant mix, one of the people said. 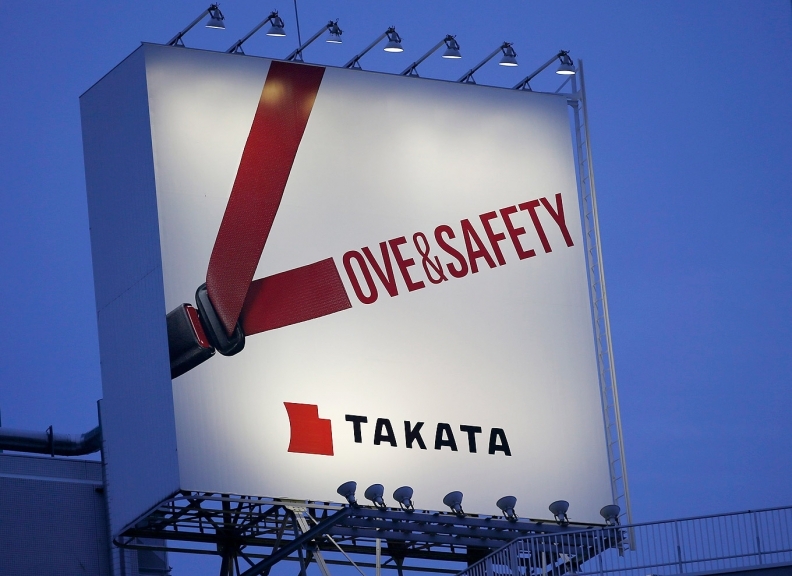 Kikko Takai, a spokeswoman for Takata, declined to comment when reached by telephone. The airbag supplier agreed to almost double the number of cars called back in the U.S. as part of a consent order with the National Highway Traffic Safety Administration, the regulator announced Tuesday, calling it the largest automotive recall in history. Takata agreed to make the recall nationwide -- a step it had resisted -- and submit its airbag parts to the U.S. government for testing. “We are pleased to have reached this agreement with NHTSA, which presents a clear path forward to advancing safety and restoring the trust of automakers and the driving public,” Takata CEO Shigehisa Takada said in a statement. Carmakers are prioritizing humid areas such as the U.S. Gulf Coast and Okinawa in Japan as the weakness of the ammonium nitrate propellant used by Takata is its sensitivity to moisture, said Scott Upham, president of Valient Market Research. Older vehicles and those in areas with high humidity will get the highest priority in Takata’s expanded U.S. recall, the company said in a statement Tuesday. Still, humidity isn’t the only issue, said Upham, who has followed airbags since they first began going into cars a quarter-century ago. “Many decision makers at the automakers are still very concerned that ammonium nitrate -- even with the fixes -- is still not a stable compound,” Upham said. Some vehicles made after 2008 have been recalled, and a different defect that can also cause ruptures prompted carmakers including General Motors Co. and Nissan Motor Co. to call back newer vehicles last year. Honda recalled the first batch of 4,205 vehicles related to the airbag flaw in 2008, after finding the devices’ propellant took in excessive moisture at Takata’s plant in Mexico. The automaker, Takata’s biggest client, has since recalled more than 19 million cars. Ammonium nitrate is “stable and safe” if moisture is properly controlled during production, Hiroshi Shimizu, Takata’s senior vice president for global quality assurance, said at a U.S. Senate hearing in November. Takata’s current products have a “well-controlled manufacturing process” and will work as designed, Shimizu said when asked by U.S. Sen. John Thune, R-S.D., about what changes the supplier has made to ensure the safety of replacement airbags. Takata, which has forecast a return to profit this fiscal year, has said it’s unable to estimate the penalties from lawsuits associated with the airbags. The company hasn’t set aside any amount to cover such penalties, as the cause of the defect is still being investigated. A group of 10 automakers hired aerospace and defense company Orbital ATK Inc. to test potentially faulty Takata airbag inflators. The Japanese component maker has also commissioned German research group Fraunhofer Society to investigate.